One of my favorite pastimes is watching tech videos on YouTube. Lately I've been really into watching PC Building videos from some of my favorite YouTubers: Linus Tech Tips, Bitwit, Paul's Hardware, and more! Speed is the name of the game here. Although my previous setup of a Razer Blade 14" 2016 model certainly didn't disappoint, it would bottleneck at the CPU level (i7 6700hq, 3.2 ghz max) and with RAM (16gb). This motherboard is designed for the latest 8th generation Intel Core processors. It has dual m.2 SSD slots, Wi-Fi, Gigabit LAN, and USB 3.1 Gen 2 connectivity. At under $200 it represents a great value. The i7 8700k is the latest and greatest consumer CPU from Intel. With 6 cores and 12 threads, it is unlocked for overclocking. I overclocked my i7 to 4.8 Ghz. Plenty of zip here for demanding software. Keeping temperatures under control is paramount to maintaining an overclocked CPU. 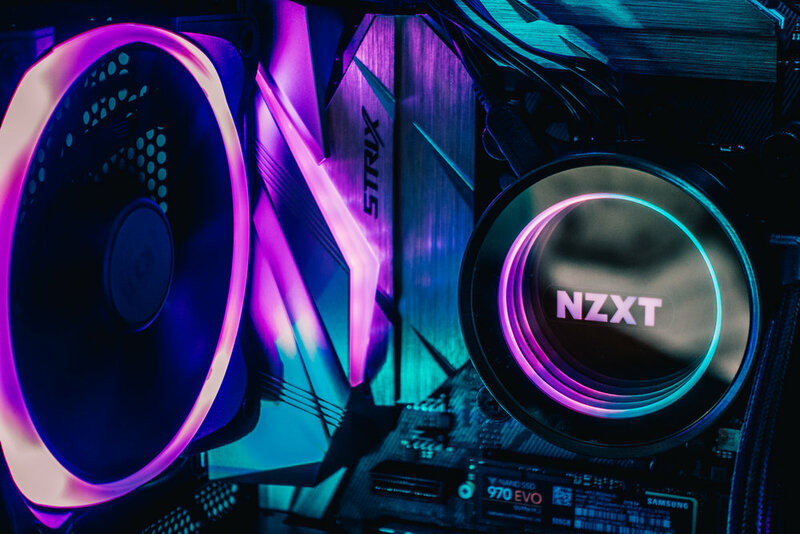 the NZXT Kraken X62 has advanced controls for liquid cooling and features a beautiful RGB infinity-mirror design. Memory is very expensive, but I didn't want to compromise here. I knew I would need at least 32gb and found the best value with G.Skill TridentZ 2 x 16gb kit. The upside of going with a two-stick kit is that I can still upgrade to 64GB down the road by keeping to RAM slots available on the motherboard. Amazon lists this kit at ~$440, but you can head over to Newegg for a better deal at $369. Since we're going with the latest and greatest, I couldn't pass up on Samsung's newly released 970 EVO NVMe M.2 500gb SSD drive. In fact, I purchased two of them to run in a RAID 0 configuration for a total of 930GB usable storage. What is RAID 0 you ask? RAID 0 essentially takes two drives, and runs them as a single drive, by striping the data across both for increased performance. I have benchmarked read and write speeds over 3 GB per second! Did I mention each drive is about the size of a stick of gum? There's a lot about this build that is overkill, but the Nvidia GTX 1080 ti is the most overkill part by far. I run dual monitors in 4k, so a decent card is recommended to push those pixels, but the GTX 1080 Ti is top-of-the-line. I play some games and this thing handles all AAA titles like a champ. However, if your build is stricly for editing, you can easily go with a lower model such as the GTX 1050 or 1060. The 1070 will still crush 1080p gaming. With a lot of expensive and critical parts, the power supply is not the place to start cheaping out. Last thing we want is to ruin the RAID configuration with unexpected shutdowns. 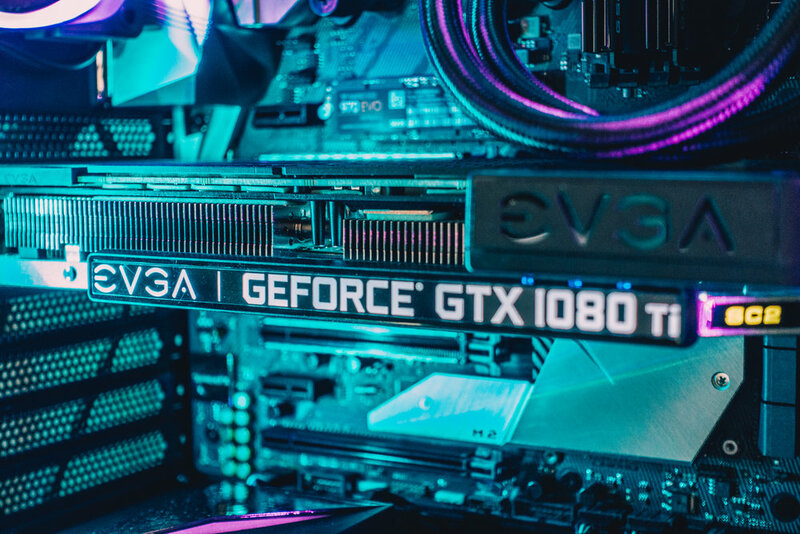 EVGA's 850 watt SuperNOVA is fully modular and Gold rated; plenty of juice to keep the machine performing. NZXT's S340 Elite is a mid-size tower and packs a lot of great features at a price below $90. It has ample room for all your hardware and makes cable management a breeze. 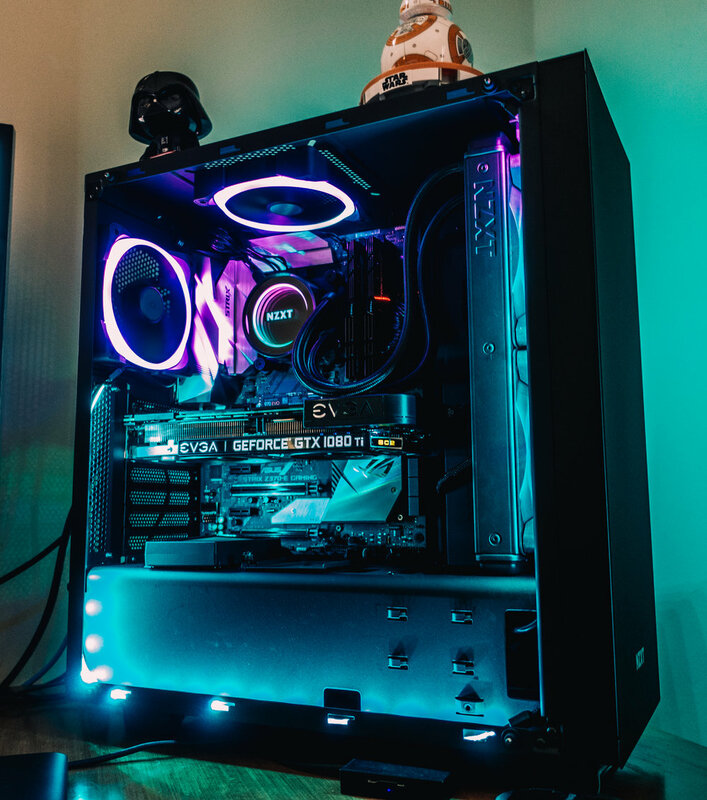 The full tempered glass side panel also helps show off everything in RGB glory. Let's be honest. We're not going to build a powerful system like this and not show it off. NZXT's HUE+ controller enables full lighting control via software. Coupled with two 120mm case fans and the Extension Kit, the only limit for lighting is your imagination. The build itself was actually fairly straightforward. There were a couple nervous moments simply because I hadn't physically performed the tasks before, but I had seen enough guides on YouTube that I had a pretty good idea of what to do. If you're looking for detailed instructions on building your own PC, here are a couple videos that helped me out: Linus Tech Tips Ultimate RGB Build Guide, Bitwit - Building a PC in the New S340 Elite from NZXT. I'm extremely pleased with how the build and overall setup turned out. My new overclocked workstation PC has breathed new life into my workflow. 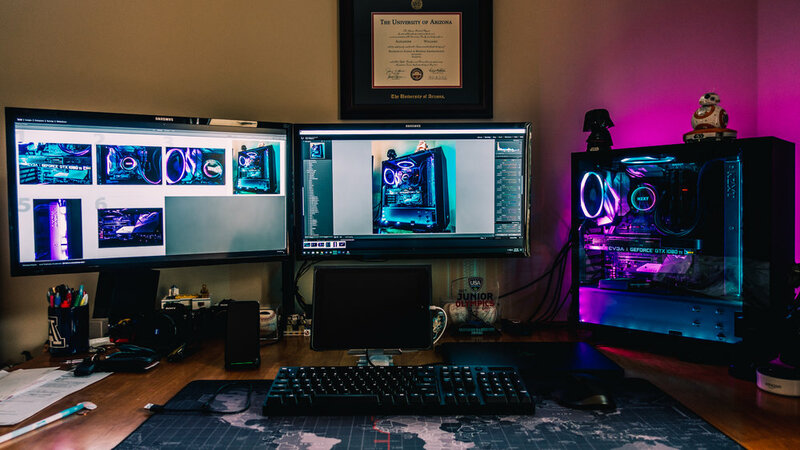 Importing, editing, and rendering photos is a breeze and PC gaming has been taken to a whole new level. If you're interested in building a PC and need some advice, please don't hesitate to leave a comment or email me.